MAs of the College (with effect from the beginning of the academic year after proceeding to the degree of MA) and PhDs and other higher degree graduates are entitled to dine with the Fellows up to ten times per academic year. Those dining assemble in the Senior Combination Room (entrance from Second Court) where wine is available from 7.20pm. Gowns are worn except when dinner is served in the Senior Combination Room (which is normal outside the dates of Full Term). After dinner coffee can be taken in the Fellows' Parlour, or wine and coffee will be served in the Senior Combination Room when there is sufficient demand. 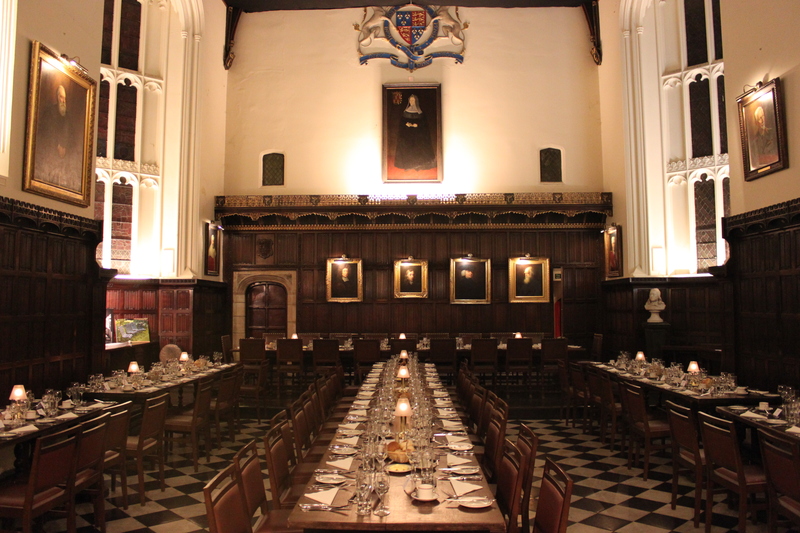 The first dinner of each academic term, including wine, is at the College's expense.There is a charge for subsequent dinners within the allowance. It may be possible to bring an adult guest to high table, by prior arrangement, provided that space is available. Please contact the Catering Office for details. The cost of bringing a guest to dinner is £48.40 including wine. Please note that a maximum of 6 alumni can exercise their dining privileges on any one night and that children are not able to dine at High Table. Bookings for High Table can be made from Sunday to Friday only. Bookings must be made before 1pm on the day on which you intend to dine. If you wish to dine on a Sunday, you are asked to book before 1pm on the preceding Thursday. When making a booking, please confirm with the Catering Office your name, date of matriculation, eligibility to dine on High Table, and any special dietary requirements you may have. Vegetarian diets can be accommodated; the College cannot guarantee to meet more specialist requirements, but will do its best to cater for particular needs.